“In the revolutions of the wheel of fortune I have often been at the top – and as often at the bottom – In other words I have been, now, four years at this place, and notwithstanding I have exerted a dilligence and prudence, hardly common to me, no prosperous wind has yet filled my sail – but the whole bag full have steadily set against me. I have never before asked an office of any president, or any executive of a state but taking into consideration the wants of myself and family – If the government of the U.S. has anything to do which I am capable of performing – you may consider me as an humble applicant – I am seeking no sinsecure; my health is good thank God – and I am only 55 years old the 20h inst. Mr. Lincoln refused to hold the friendships of others against them. He ordered the reinstatement of Army Captain Edward W. Andrews, who was a political supporter of George B. McClellan in the 1864 election. “Supporting General McClellan for the Presidency is no violation of army regulations, and as a question of taste of choosing between him and me, well, I’m the longest, but he’s better looking.”32 The general of whom Mr. Lincoln spoke about so benignly had once written a telegram to his superiors at the height of the Peninsula campaign: “If I save this army now, I tell you plainly that I owe no thanks to you or to any other persons in Washington. You have done your best to sacrifice this army.”33 Yet when a few weeks later, Mr. Lincoln needed a general to pull together the Army of the Potomac after the Second Battle of Bull Run, he went to McClellan. A general didn’t need to be President Lincoln’s friend if he could advance and protect the Union cause. Douglas L. Wilson and Rodney O. Davis, editor, Herndon’s Informants, p. 358 (Mary Todd Lincoln interview with William H. Herndon, September 1866). Roy P. Basler, editor, The Collected Works of Abraham Lincoln, Second Supplement, p. 29 (Letter to Ozias M. Hatch, March 24, 1858). Douglas L. Wilson and Rodney O. Davis, editor, Herndon’s Informants, p. 166 (Leonard Swett’s letter to William H. Herndon, January 17, 1866). Roy P. Basler, editor, The Collected Works of Abraham Lincoln, Volume V, p. 42 (Letter to B. Gratz Brown, January 7, 1863). Howard K. Beale, editor, The Diary of Edward Bates, p. 324 (December 24, 1863). Charles H. Coleman, Abraham Lincoln and Coles County, Illinois, p. 121. Rufus Rockwell Wilson, editor, Lincoln Among His Friends: A Sheaf of Intimate Memories, p. 128 (Lambert Tree, Century Magazine, February 1991). Albert A. Woldman, Lawyer Lincoln, p. 109. Charles B. Strozier, Lincoln’s Quest for Union: Public and Private Meanings, p. 223. Charles H. Coleman, Abraham Lincoln and Coles County, Illinois, p. 122. Charles H. Coleman, Abraham Lincoln and Coles County, Illinois, p. 123. Rufus Rockwell Wilson, editor, Intimate Memories of Lincoln, p. 91 (Thomas W. S. Kidd, speech to Bar Association of Sangamon County, April 25, 1903). Rufus Rockwell Wilson, editor, Intimate Memories of Lincoln, p. 24 (Joshua F. Speed). Carl Sandburg, Abraham Lincoln: The War Years, Volume II, p. 285. Gerald M. Capers, Stephen A. Douglas Defender of the Union, p. 182-183. Rufus Rockwell Wilson, editor, Intimate Memories of Lincoln, p. 148 (William Martin Dickson Harper’s New Monthly Magazine, June, 1884). Gerald M. Capers, Stephen A. Douglas Defender of the Union, p. 219. Rufus Rockwell Wilson, editor, Intimate Memories of Lincoln, p. 243 (Leonard Wells Volk, Century Magazine, December 1881). Roy P. Basler, editor, The Collected Works of Abraham Lincoln, Volume V, p. 342-343 (Letter to Reverdy Johnson, July 26, 1862). Roy P. Basler, editor, The Collected Works of Abraham Lincoln, Volume V, p. 346, 356 (Letters to Agénor-Etienne de Gasparin, August 4, 1862 and Cthbert Bullitt, July 28, 1862). Allan Nevins, The Statesmanship of the Civil War, p. 125. Roy P. Basler, editor, The Collected Works of Abraham Lincoln, Volume IV, p. 200 (Fragment of Speech intended for Kentuckians, circa February 12, 1861). Allen C. Guelzo, “Holland’s Informants: The Construction of Josiah Holland’s ‘Life of Abraham Lincoln’”, Journal of the Abraham Lincoln Association, Volume 23, Number 1, Winter 2002, p. 50-51 (Letter from J. T. Duryea to Josiah G. Holland, July 13, 1865). Roy P. Basler, editor, The Collected Works of Abraham Lincoln, Volume VIII, p. 96 (Response to a Serenade, November 8, 1864). Roy P. Basler, editor, The Collected Works of Abraham Lincoln, Volume VIII, p. 101 (Response to a Serenade, November 10, 1864). Abraham Lincoln, Complete Abraham Lincoln Writings, (http://books.google.com). David Chambers Mearns, Largely Lincoln, p. 93. Douglas L. Wilson and Rodney O. Davis, editor, Herndon’s Informants, p. 351 (David Davis interview with William H. Herndon, September 20, 1866). Douglas L. Wilson and Rodney O. Davis, editor, Herndon’s Informants, p. 186 (Letter from Joseph Gillespie to William H. Herndon, January 31, 1866). 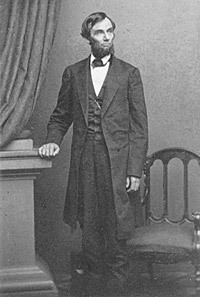 Noah Brooks, Abraham Lincoln: The Nation’s Leader in the Great Struggle Through Which was Maintained the Existence of the United States, p. 423. Nathan William MacChesney, editor, Shelby M. Cullom, Abraham Lincoln: The Tribute of a Century, 1808-1909, “Lincoln and His Relations with Congress”, p. 503-504. Allen Thorndike Rice, editor, Reminiscences of Abraham Lincoln, p. 518 (Edward W. Andrews). Stephen W. Sears, editor,The Civil War Papers of George B. McClellan: Selected Correspondence, 1860-1865, p. 323. James F. Rhodes, History of the United States, p. 181-182. Allen Thorndike Rice, editor, Reminiscences of Abraham Lincoln, p. 237-238. Charles M. Segal, editor, Conversations with Lincoln, p. 210. Carl Sandburg, Abraham Lincoln: The War Years, Volume IV, p. 171. Carl Sandburg, Abraham Lincoln: The War Years, Volume IV, p. 179. Roy P. Basler, editor, The Collected Works of Abraham Lincoln, Supplement, p. 356 (Letter to John J. Hardin, January 19, 1845). Roy P. Basler, editor, The Collected Works of Abraham Lincoln, Volume IV, p. 49 (Letter to Mark Delahay, May 12, 1860).